When the most prominent grade II listed building in Derby was renovated more than 200 reliable and efficient manual and automatic door operators were needed that would ensure ease of use, whilst closing effectively to allow electronic locking for security reasons. Satisfying this requirement was the challenge faced by GEZE UK at Derby City Council’s offices when it was commissioned by architectural ironmonger Eisenware Limited on behalf of the project architect Corstorphine and Wright to supply a range of automatic door operators as well as manual door closers. For the Council Chamber, which features large 2.4m high wooden doors, and for specific wooden and glass doors in the corridors, GEZE’s Slimdrive EMD-F electromechanical swing door operators were specified. While it is unusual for automatic operators to be fitted to internal glass doors, the slimline design of the EMD-F operator means that at just 7cm high, it is extremely discreet and sits neatly on the doors’ patch rails. In this case, automatic door operators were chosen for the internal doors so that swipe cards could be used to restrict access to certain areas of the building and also to assist with the vigorous demands of the Equality Act. 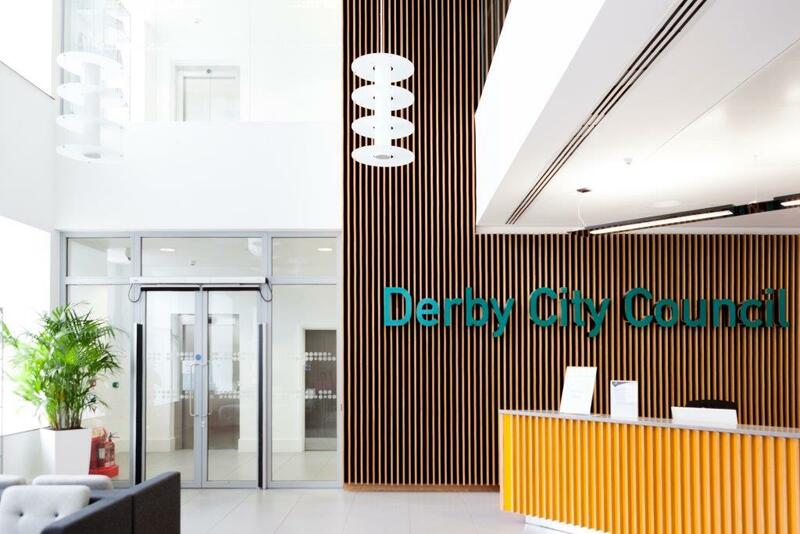 “By redesigning the interior of the Derby City Council offices, the architect has provided a workspace for 2,000 staff, as well as for visiting groups and members of the public. Eisenware worked closely with the client to understand the architectural ironmongery needs throughout the entire building, specify the right solution and schedule installation in line with the build process. Throughout the rest of the building, doors were fitted with GEZE’s manual range of overhead closers. More than 175 TS 2000 NVs were installed. These are ideal for public buildings because they feature an over pressurisation valve, which protects the operators from damage caused by abuse. They are also highly efficient and feature fully adjustable closing speed, hydraulic latching action and adjustable closing force making it easier to conform to the requirements of Approved Document M and BS 8300. A further 21 TS 4000 manual overhead closers were used. The TS 4000 offers fully adjustable power EN 1-6 and is suitable for doors from 750 - 1400mm wide. It is also fitted with an adjustable backcheck as standard. Finally, 11 fire doors were fitted with the TS 4000 E, which has been specifically designed and approved for use on fire and smoke protection doors. It features an electrohydraulic hold open device, which is released in the event of a fire allowing the door to close safely. This compartmentalises the building, holding back fire and smoke, allowing occupants to escape safely. All of GEZE’s closers are tested to EN 1154 are CE marked and have a DoP. Furthermore, they all have the same styling and match the finish on the automatic operators giving conformity of design throughout the building. The building refurbishment, which has subsequently won the Refurbished / Recycled Workplace category at the 2014 BCO (British Council for Offices) Awards, was designed to achieve a BREEAM rating of Excellent and an A rated Energy Performance Certificate. Electricity is even generated by a hydro-electric system that harnesses power from the River Derwent. It was, therefore, important that all contractors were equally committed towards this aim. GEZE UK has achieved ISO 14001 and is committed to minimising environmental impact both through its products and processes. For more information about GEZE UK’s comprehensive range of automatic and manual door closers call 01543 443000 or visit www.geze.co.uk .